I've been working on this sampler for about 2-3 years. Not steadily....just when I take a trip or have a bit of time. I'm getting close to the end and just the idea of being almost done makes me want to work on it more. This sampler and I have had a love/hate relationship. I've made so many mistakes I can't even begin to talk about it. Most I have just left in the sampler....because this should be fun right? I'm doing this for relaxation. (I repeat this like a yoga mantra over and over.) As I study the motif trying to find my mistake, many times I can't even find where I went wrong. Those Quakers and all of their geometrical patterns! 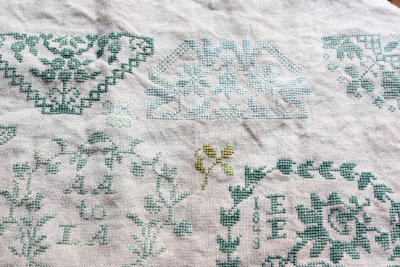 This sampler is the Beatrix Potter sampler from Needleprint. The initials I'm adding are those from my maternal line. We have names and dates for 10 generations of women in my family. I'm stitching this for my daughter. The initials on the left are mine and my daughter Laura's....the initials on the right are my Great-Great Grandmother's. Elmina Embree was born in 1849 and traveled from Iowa to Nebraska in a covered wagon. She was a Quaker. 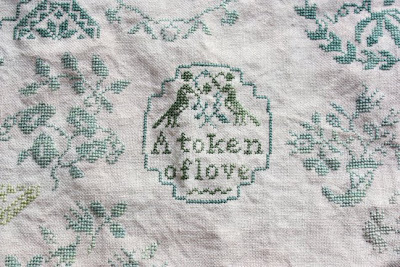 With my Quaker heritage this is the perfect sampler to stitch for my daughter. It truly has become a token of love. I'm getting up early and stitching for about an hour. Beatrix and I have now become one....so much so that I've begun another Quaker for my niece Martha. So beautiful! And it really is true ... the closer you get to finishing, the less you can stand to put it down. It is looking so good...I am just getting ready to start the Mary Wigham sampler. It looks so similar to the one that you are doing. It will probable take me a long time to do it too. Now that the end is in sight don't you feel good about it?!! You have inspired me to hurry and get going with mine. Oh it's so pretty! I love what you're doing with it. I somehow never dare to personalize things. I should do that more often. I think it's wonderful that you have a Quaker heritage. We attended Quaker meeting before our kids, and our daughter attended a summer camp run by Quakers. Does that count? lol! Lovely colors you have chosen... this will be beautiful! I just got Beatrix framed. It took me a while to stitch. I loved stitching it though. Yours is so lovely. What is the second one? Love the colors you have chosen. So, so pretty! I stitched Quaker Christmas last year and I felt the same way with it. 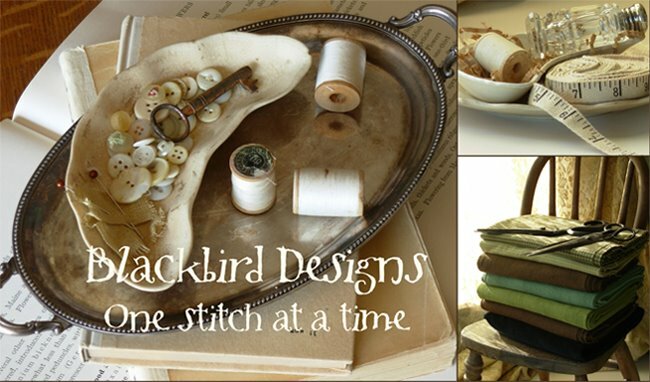 I love Quaker designs! What a wonderful gift for your daughter, especially knowing your quaker background. I am sure she will treasure it. BTW... Just had to tell you, I love your blog and are a big fan of all your designs. both the samplers are beautiful. be sure to include a family tree with the sampler. It's going to be beautiful. I know how you feel though. I started A Quaker Christmas sampler last year and was going great guns until I found a huge hole in my fabric where the threads broke! Haven't worked on it since. Makes me want to pick up some cross stitching again. Sheesh, so many crafts, so little time. Your sampler is beautiful! Very cool that you have that much family history that you can work into it. Alma, your stitching is so beautiful. Do you know where I could order a Beatrix sampler similar to this? any help would be appreciated. Thanks you. That is so beautiful and it's neat that you have your relatives initials on there as well too and that you are giving it to your daughter. I can't wait til I see more progress on the other one. Wow, gorgeous! Congrats on nearing completion on this project. It looks like you are starting Mary Wigham, perhaps? I started her a bit ago but am still on only the first motif! What a gorgeous piece. Such a special thing to make for your daughter. I love this sampler! Quaker samplers are one of my favorites! What a special sampler that will be! I hardly ever correct perceived errors...in the big scheme of things, it just makes it more personal! :o) Lovely colors you're using as well! Love the green shades. Have you had a look at SAL blog? It will give you inspiration to keep going. This will be so wonderful! I'm stitching this sampler too and I had some mistakes, but... I don't care. Mine is stitched over 1! How lovely that you can trace your family back so far. Your daughter and niece will be thrilled to bits with their quakers I'm sure. Beautiful work, Alma - you're so close to finishing, I can see why you'd have trouble putting it down. Alma your family history makes this sampler so interesting. I saw you working on this piece last year at the Heart's Desire Camp. You've gotten alot more done on it since then! 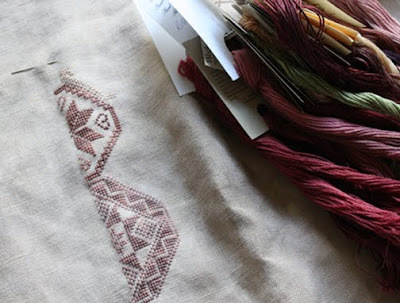 Which sampler are you working on now? I understand the love/hate, I've just frogged a medallion on my model and still don't know where it went wrong! LOL But I love Quaker Samplers! Thanks for sharing!! Your Beatrix is just lovely. I really like the colors you chose - soft and soothing. When I finish Mary Wigham, Beatrix will be the next Quaker that I start as she is just wonderful. Congratulations on your progress. I also have the Beatrix Potter sampler. I have the fabric and have decided on my thread colors; it is a blue-green monochromatic scheme. Heaven only knows when I can begin it there is so much that I must do beforehand. 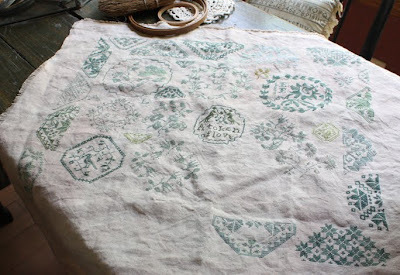 There is something so very soothing about stitching Quaker motifs. It really beautiful Alma, your daughter will treasure it as much as her heritage. I love Beatrix Potter!!! Your last picture is amazing, there is just something about the half stitched pattern and empty space where the pattern will be, its quite magical. I know how you feel about getting close to the finish, it quite exciting. What lovely quakers, Alma!! It shouldn't be long now before you finish Beatrix...what an heirloom it will be with the women in your family! Very beautiful! Is this going to be framed or a pillow? Just curious. My 25 year old daughter is making this sampler on aged looking linen with a rich brown thread. She says there are a few mistakes in hers too, so must be the nature of it! She is coming down to the finish line as well, and she can't wait to start another antique sampler. We both just love them! Wow! What treasured heirlooms these wonderful Quaker designs will be for your daughter and niece! Carlie- The new Quaker I'm working on is Mary Wigham. Margaret- You should add your family history to your samplers too...you have those cute kids that will enjoy seeing family names on your samplers. And the meeting totally counts! The Quakers kicked out my family as Elmina married her husband without permission. Marjo - Mary Wigham by Needleprint. Go on their blog site and you will find a link to the sampler. Beth...Pick it up again. I'm going to show a primitive way to fix your hole. Ann- I think you can download Beatrix Potter from the Needleprint web site. She is out of the printed pattern but came out with the pdf format to meet the continued demand. Bev- This piece will be framed. My daughter has a very bad cat....no Beatrix Potter pillow for her! Dixie- Your daughter's colors sound wonderful. I bet her's will be fabulous! My Bea says hello to yours. Your BPS looks lovely, esp. with the idea of remembering all your female familymembers.